history | Thots and Expressions..
Posted by Afrozy Ara in Book Reviews, Classics, Fantasy Fiction, Sci-Fi. 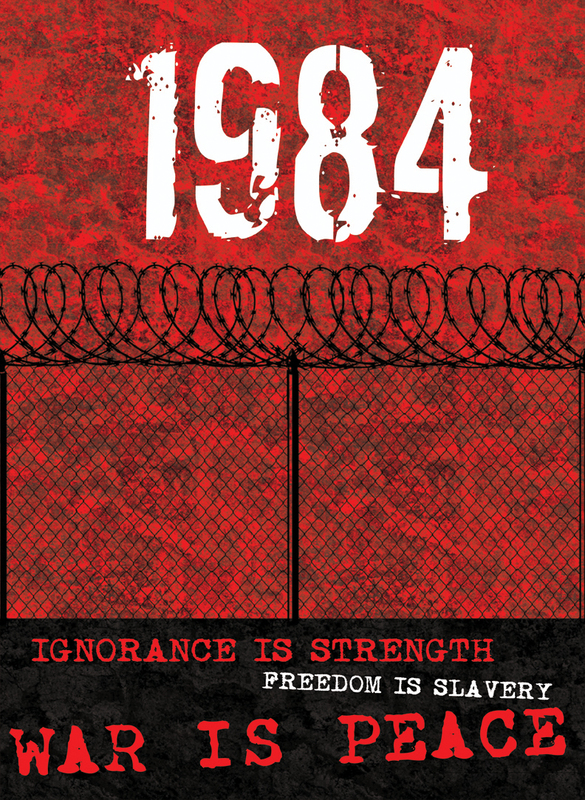 I am writing the review for this book 1984 I read a while ago and the words that ring in my head are: “Nothing is stronger than an idea whose time has come.” I know this is totally incongruous to the subject, but no amount of shooing drives these words out of my head. They keep buzzing around like flies on a hot summer afternoon, and I console myself with the thought; perhaps there is a link somewhere, which will eventually dawn upon me!. Now coming back to the Novel… When you think of dystopian worlds, George Orwell’s book is a classic. I had always seen this name in the list of top books of all times; and it lingered in the back of my mind, gnawing at my to-read list for a long time now. For what reason – I am not exactly sure; maybe because it has this power, a captivating aura around it. Made famous by allusions to “Big Brother” and “Room 101” in countless articles and publications.. And of course, the iconic 1984 Apple commercial that heralded the release of the first Mac! Before beginning the book, I already had these subliminal negative vibes about it.. This book is about power, about total loss of individualism, about an nightmarish world where everything has gone wrong.. A universe of totalitarian oligarchic control.. A book about the madness which dwells in humanity…suppression of justice.. About the mutation of happiness.. war crimes and rants against a changing common enemy.. A book about humans pushed to their worst. And how hell can be raised purely from the potency of our thoughts! Okay, 1984 is definitely not a happy book. It is not a sad book. It isn’t even a scary book. I felt it to be a very thoughtful book, showing what depraved limits we can push mankind to, and man’s vulnerability to thought control.. Exposing the chinks in the fabric of our psychology. Baring our worst nightmares….. It warns us against this extreme form of civilization…and that a dystopic world like this is no impossibility because “Nothing is so unbelievable that oratory cannot make it acceptable”! You know, what’s most impressive about 1984 is the completeness with which its dystopian world has been portrayed. Thoughts, words, language, expressions- everything is government controlled.. It is scary, but fascinating – the depth to which the author has explored the psyche of the totalitarian state. It also makes you wonder.. What is it that defines who we are? Our ability to think?.. The language that allows us to express ourselves.. Our family ties? How is that kind of a world going to be?? The ideas portrayed in this book are mind-boggling. And the importance of individualism is so starkly expressed in a world totally devoid of it. One of my favourite lines from this book poignantly expresses this – “Being in a minority, even a minority of one, did not make you mad. There was truth and there was untruth, and if you clung to the truth even against the whole world, you were not mad”. This one is a must read book if you are curious about History, Politics, Economics and Human Psychology. Not all the ideas are radical or unique – we have learnt lots of it in history lessons and newspaper columns. But then – the best books, are those that tell you what you know already!..